It's with great sadness we announce the passing of Gabbi. We lost her Saturday night. Glenn and the family returned home after my wedding to find Gabbi unable to get up. She was carried upstairs where she was examined by my sister who is a vet tech. She was unable to stand in the hind end and when supported she had no proprespetion (spelling?) in her hind end. She had very delay response in her front end. Upon further examination her gums were white and she had a glazed looked in her eye. We decided it was time to say goodbye and let her go. For those of you who don't know she was diagnosed with cancer in January 2010. Our feeling is the cancer had spread and we believe at the end, as she "crashed" in a matter of hours and base on symptoms, that perhaps some how it caused her to have internal bleeding. Gabbi had been a part of Glenn's (my step-dad) life for about 14 years. I met Gabbi in 2005 and she was the dog that made me fall in love with breed. She was loved immensely and will be missed greatly. The house isn't the same without our boss girl. Minnie seems to be doing okay though. We were concerned the passing of Aunt Gabbi would upset her world, but she seems to be okay for the most part. Perhaps she new before we did just how close Gabbi's time was. 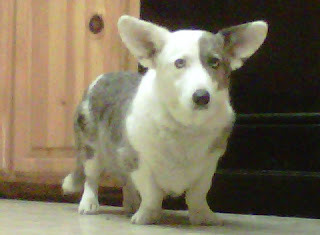 Have fun herding those sheep in the sky Gabbi-Goo, you will be forever missed.